The ace of spades served a famous purpose during the war in Vietnam. The US troops believed Vietnamese traditions held the symbolism of the spade to mean death and ill fortune. This belief in influenced US troops to use the ace of spades as a psychological weapon against the Viet Cong or National Liberation Front (NLF). In February 1966, two lieutenants of Company "C", Second Battalion, 35th Regiment, 25th Infantry Division, wrote The United States Playing Card Company and requested decks containing nothing but the Bicycle ace of spades. In an attempt top scare away the Viet Cong/(NLF), it was common practice to leave an ace of spades on the bodies of slain Vietnamese soldiers or to spread on the ground and fields. War movies have also been bade showing US soldiers with the Bicycle ace of spades sticking out of their helmets. 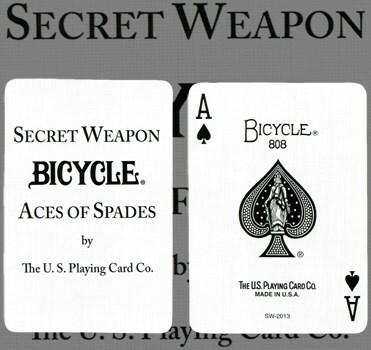 The Bicycle Secret Weapon deck was reprinted during Operation Desert Shield. This time the decks were printed as a war-time tradition more than a psychological weapon.